Where has content distribution been since 2000 and where is it going? 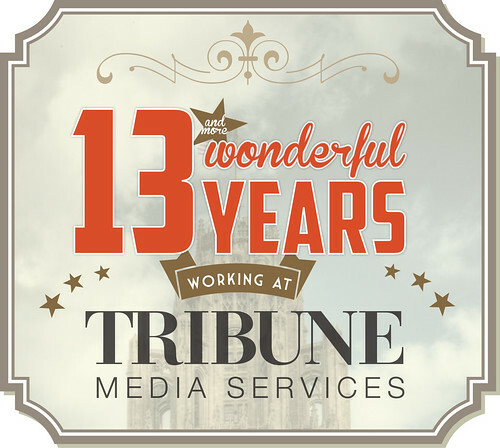 This month I celebrate 13 years working at Tribune Media Services, a syndicate that distributes over 180 columnists, comic strips, and puzzles. I missed my opportunity at my 10-year anniversary party to explain my passions behind working at a syndication company. The surprise party delightfully caught me off-guard and I was too shy to give a gushing explanation about why I love working here. Working here isn’t just another job. It’s the job for me. I started here at the Tribune Tower in the year 2000. But first, let’s touch on a couple years prior to that. After graduating from a small college with an art degree in 1997, I explored the Chicago art scene, and the blossoming art scene online in the late 90s. It quickly became apparent that that was a ton of art being produced in the world. A ton. So much artwork being made by artists that wasn’t being seen. As an artist, I felt bad adding more artwork on top of the pile of working being done already; especially since there was already so much great work being done by others that wasn’t getting the attention it deserved. I wanted to make it a goal to help other people get their work promoted and seen. One of the methods was through a tight community group I created for my fellow art alumni and students from my college, Illinois Wesleyan University. The website and email group was like a Facebook ten years before that was a Facebook. Everyone had their own user profile and most importantly, it enabled everyone to share their own personal news and the work of what other people were doing. When the job listing for Tribune Media Services appeared in the paper in 2000, I greatly desired to be able to work here. This job isn’t just a job for me. Working here is a philosophy of life. I strongly believe in helping people get their work distributed. The concept of syndication is one that I get very excited about to this day. We help authors get their work read. We help publications reach their audience. We help readers to have better content to consume. And now I would love to help continue that circle by enabling readers to become content creators. This happens through reading content online and then reacting to that content through all the methods of social media and online publishing. One piece of that puzzle is content marketing where we help brands use content to reach their readers. But content marketing is not the end story. In order for content to be fully digested, the content has to be engaging enough where it inspires people to share the stories. To build off the stories. To continue the story in their own words. I’m excited to be able to have the wonderful opportunity to work at Tribune Media Services, because we are at the very hub of this content world. It will be exciting to see how that develops and how we can play a critical role in spreading great ideas to the world. The second-to-last paragraph starts getting a bit jumbled and little confusing, because I make some jumps around in concepts. I didn’t explain those in detail, because then it would end up being more of a talk than a speech. Happy 13th Anniversary, Matt! It is refreshing and inspiring to read your “speech”…with a perspective like yours (“working at TMS is a philosophy of life”), it is clear to see why you have found such success there during your 13 year tenure. It is way cool to see your passion–art and assisting/supporting others–play out through your job. Kudos!